I’ve just been away for a fabulous weekend to celebrate a dear friends 40th, with ten 30- somethings and fellow 40-somethings. With the inclement weather and snow in Northumberland, we were not dressed in our finery. Let’s say onesies, fleeces, welly socks and thermals were more the order of the day…. (and the cutest “baby long johns” in the case of Ed – 5 months!). All the lovely girls I was with are, like me, keen to look reasonable on a limited budget and discussing our approach to shopping for clothes, on the return journey home, I felt inspired to share the tips of the renowned “Mrs Exeter” pictured below, that appeared in the current edition of Vogue. 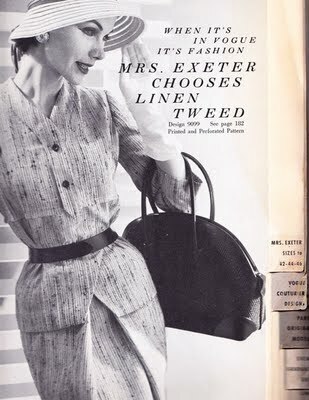 Mrs Exeter was a fictional character who appeared in British Vogue (Brogue, apparently!) in the 1950’s. She shared pearls of wisdom about “ageless clothes” to women of all ages, but especially the over 40-somethings! I think you’ll agree they are as relevant in 2013 as they were then – and they certainly chime with the FrockChicks ethos…. May I add that one should be aware of the lure of the “Up to 70% off sales” that tempt us daily from different retailers, and even worse, the “Extra 20% off Sale Prices”. These apparent savings can seem all too appealing but can often result in compromising on size, colour, fit or the right style, all for the satisfaction of the “bargain”. I have been caught out a few times on this one, being the cheapskate I am. Fit, comfort, individuality/”ingenuity” and cost per wear must always be the paramount deciders. It may be better to walk away from the cash till, leaving your purchases behind and head back home. Open your wardrobe, have a good old ferret around. What could be reworked for your spring wardrobe with the right components to make an on trend outfit? A bit of simple tailoring – new length, new collar shape or even dyed to suit you in a more fashionable and flattering colour. Alternatively pop along to our Little Frock Shop in Surbiton on Thursday or Friday this week, run by the lovely Lisa. Special winter sale – 15% off all items. FrockChicks are there too, giving free style tips. We are at Rubicon in Surbiton, every last Thursday evening and Friday morning of the month. (And also at The Swan in Walton on the second Thursday of every month). Bring your freshly laundered, pre-loved clothes that you no longer wear along for Lisa to sell (50% to you, 50% to her), and put the proceeds towards a “new” purchase at the Frock Shop or in the piggy bank towards that investment piece you’ve had your eye on for a while. It’s all so much easier than Ebay. For those nearer Berkshire, The Stock Exchange in Sunninghill works on a similar basis and is a treasure trove of bargains. Failing those options, head along to your nearest charity shop – and hunt out the quality items that could fill an essential niche in your wardrobe – a classy scarf, a trench coat…but again don’t be lured by the price tag and end up with some ill-fitting, bad quality item that you actually have no occasion to ever wear..or requires you (in the words of Mrs Exeter) to tread the “treacherous” path to needing to find a whole host of other things to make the item work! Wishing you all a happy 2013 with a wise wardrobe that works. Remember, get in touch with FrockChicks if you need any help in the style department…..
P.S. Whilst on the subject of Vogue, may I also recommend the inspired Anniversary present my husband gave me this year….”GRACE” The memoirs of Grace Coddington, (the Creative Director of American Vogue). Not sure of her views on “Frugal Fashion” – but hey! The cover blends perfectly with my new Orla Kiely bedroom colour scheme so the book looks good on my bedside table (v important! ), it is incredibly readable, beautifully illustrated and “Grace” happens to be one of my favourite words in the English language due to its meaning – a gift that we don’t deserve! Not sure I deserved this, among many other things! Next gift idea “The September Issue” – hint, hint! This entry was posted in News and tagged 1950's, advice for sales shopping, ageless dressing, budget shopping, FrockChicks, frugal fashion, Grace, Grace Coddington, little frock shop, Memoirs of Grace Coddington, mrs exeter, onesies, The September Issue, Vogue. Bookmark the permalink.